The USB 2.0 3 port hub U2H-AK4B and USB 2.0 4 port hub U2H-K4B2 from Elecom Corporation are the perfect device multi connection for USB devices. The hubs are available in different pleasing colors. Power consumption when is using one port is 100mA and 350mA for 4 ports use. When the hub connects USB 2.0 devices to a USB 2.0 port, you get data rates up to 480Mbps – perfect for graphics, multimedia, or gaming applications. The Plug-and-Play USB 4-Port Hub is fully backward compatible with earlier USB devices. The Hub supports all USB devices, including digital cameras, scanners, game controllers, keyboards, portable data storage, mice, modems, printers, and more. LED indication of USB device in use is missing-a great draw back. 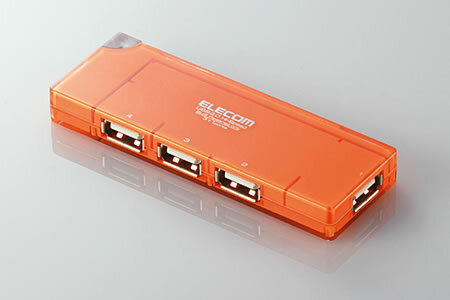 The Elecom USB hub’s measures approximately 94×33×11mm and weighs 30g.The product will be available from August for approximately 3,150 Yen($27).